The flight to Frankfurt was surprisingly pleasant. Going through airport security at Dulles was inconvenient, as usual, but not anything out of the ordinary. Some of the screeners were uptight, but my fellow travelers were patient and friendly, and that made everything much easier to endure. Frankfurt Airport was about the same. It was the first time that I had ever flown business class (United Airlines) and it was such a pleasure to get free wine and all the nice service, not to mention lots of legroom. Once in Frankfurt I met up with my wonderful host, Rev. Kurt Oberschäfer, and he drove us to Paderborn (approx. 168 miles north of Frankfurt). It was my first time on the Autobahn and the driving was just as fast as I had heard described, but not much different from I-70 back home. I was interested to learn that there are actually speed limit “cancellation signs” which show the number (e.g. 100 [km/hr]) with three diagonal lines through it (///) to indicate “no speed limit.” I love Germany! There is a good bit of snow here, and the scenery along the drive was like a Christmas card. The hotel where I’m staying, Welcome Hotel Paderborn, is fantastic! It’s very new and modern and the staff is extremely friendly. 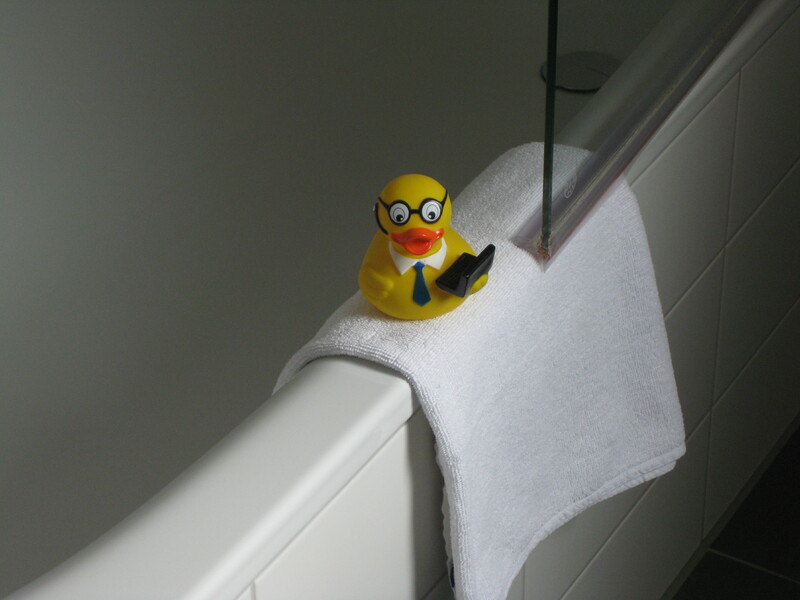 As a nice touch, they even put a cute little rubber duck on the bathtub when you check in. As you can see from the picture, they cater to business travelers because the duck is holding a laptop and wearing a Bluetooth earpiece – ! (Who knows, maybe he’s on Skype?) They have free internet in the room, but it’s Ethernet, not wireless. This is good because the connection is faster and more secure, but it’s a good thing that I took Rick Steves’ advice and brought a 3′ network cable with me. I find it amusing that everyone uses the German pronunciation for my surname here (Köhler, nicht “Koehler”). Speaking German is going well so far – even made it successfully through dinner last night with no English at all – but sometimes people think I know more than I do because my pronunciation is better than my grammar. I’m looking forward to improving over the next two weeks. I’m having trouble uploading photos at the moment and hope to be able to post more soon. I’m still learning iPhoto and it won’t let me access files to post on WordPress (iPhoto seems to want total control). I just opened a Flickr account and hope to be able to post a lot more photos that way. If anyone has good advice about dealing with iPhoto or Flickr, please post comments. I’d really appreciate your help! Looking forward to having the first rehearsal later today! Grüssen aus USA! (Hope I got that right; mein Deutsch ist sehr alt). Sounds like you have had a marvelous experience all around up to now–and that will undoubtedly continue. For the photos, you may well find Image Capture (in the Applications folder) works better for your purposes than iPhoto. Image Capture just lets you get the pictures off the camera and into any folder you choose, and that’s it. FYI, Thursday’s rehearsal went quite well all told, given the fact that nearly everyone was sight-reading, and we were missing a number of important parts (one of the clarinets, two trombones, etc.). But I was pleased and am looking forward to next week too. Auf wiedersehen!